I am celebrating Earth Day today by enjoying the trees gathered in my collection. Enjoying their beauty and their contribution to the planet. So many people live in hermetically sealed apartments and home with no lawn or garden, no trees and maybe a postage stamp of grass. In Bonsai we work to preserve nature and in some cases can collect endangered species to preserve them for the future. We handle our trees with care, ensure they are fed the best natural foods, water them carefully with our limited resources. Why do we do this? To bring nature back into our lives while enjoying the living art. Contributing oxygen back into our planet where we are surrounded by concrete and glass structures. I am reminded of this as I drive around the Bay area and witness endless miles of pavement, buildings crowed together and limited heat radiating man-made surfaces. Get out in the air today, breathe some clean air away from exhaust, put down the electronic devices and listen to the sounds of nature around you. Stop and smell the flowers? Yes that too. 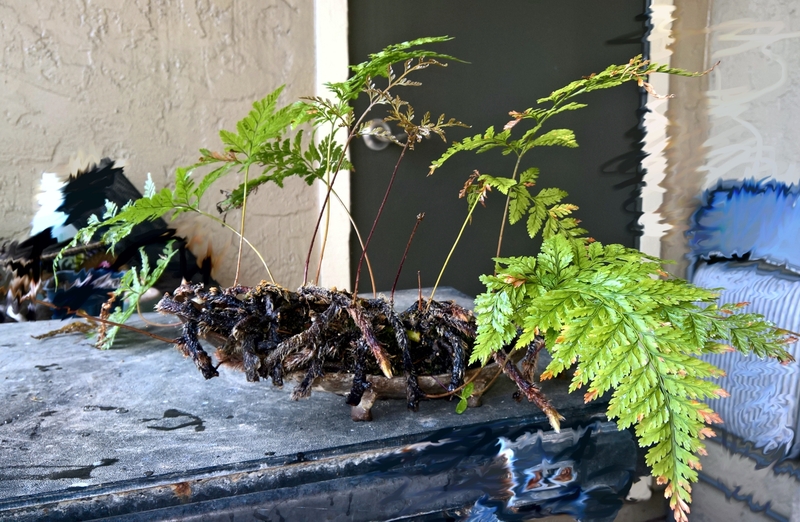 Rabbit’s Foot fern joins the Kusamono collection after years of development from a cutting. 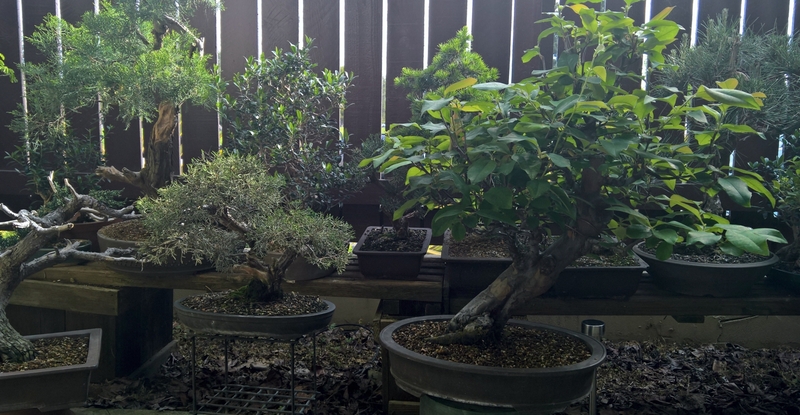 Celebrating plant diversity with boxwood, olive sierra juniper, pygmy cypress, shimpaku juniper, pepper tree and more. Contributing to the the planets health and enjoying living art. Quince, juniper, olive, and more in a celebration of Earth Day. 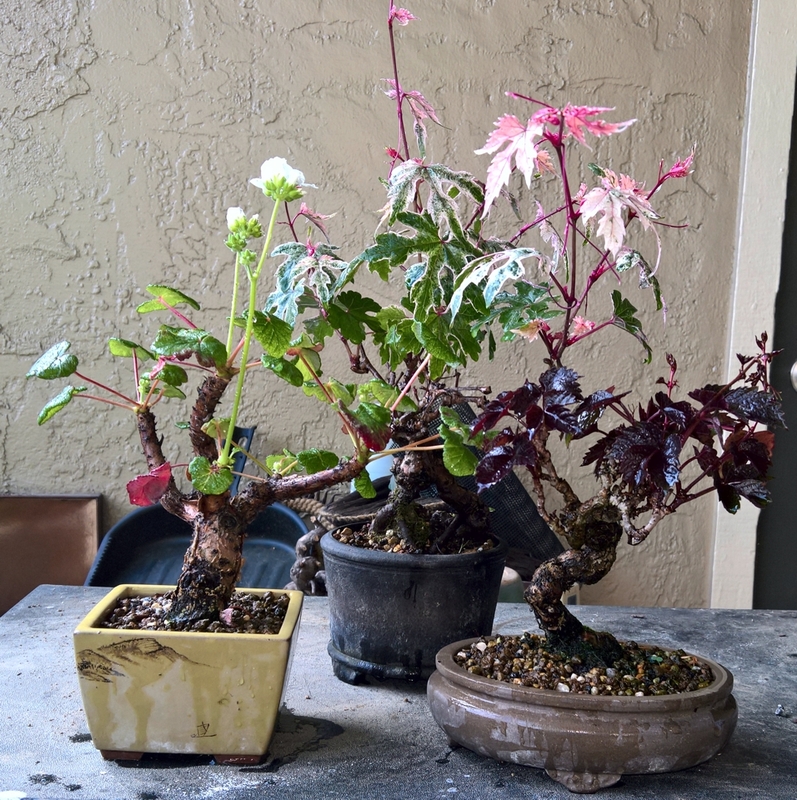 Celebrating natures color and blooms: 2 very different geranium species and a Boston Ivy. I love the color and textures of these trees. Nice. Thanks for sharing Jerry. We are celebrating Earth Day by rearranging the benches our trees are on and planting tomatoes.